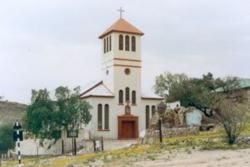 Nestled between hills on the outskirts of the southern coastal plains en route to Lüderitz, the small town of Aus bursts with history and intrigue. When German troops surrendered to South African forces on 9 July 1915, un-commissioned officials were gathered in Aus and housed in a camp, around 1500 soldiers were imprisoned here. It was closed after the treaty of Versailles was signed in May 1919, all prisoners were released and the camp dismantled. All that remains today are a few lonely WWI graves. About 20km west of Aus lies the Garub Pan where a permanent water supply has been erected for the feral desert horses that roam the plains here. Their origin is attributed to at least 3 different tales of which not one can be proven fact or fiction. The railway that used to pass through Aus from Keetmanshoop to Lüderitz has been reclaimed by the Namib Desert. The endless winds kept pushing sands over the tracks, thus they were abandoned and left to the fate of the harsh desert. Although small, the town offers visitors a wide variety of beautifully scenic routes in all directions. One of its most special features is that it frequently bursts at the seams with fields of wild flowers in a seemingly dry desert environment.